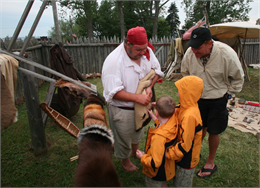 See history come alive at the “Exploring the Lake Superior Fur Trade Festival and Re-Enactment”. As guests cross over to the island, they will be immersed in a living fur trade encampment on the Madeline Island Museum lawn. Guests will have the opportunity to explore 150 years of fur trade history. This year, the fur trade historians and re-enactors will be focusing on three major themes: the role of the Ojibwe in the fur trade, the life of a voyageur, and the role of women on the frontier. The weekend will be packed with interactive programming for the whole family. This annual event, held every July, explores the history and customs of the French, British and American Fur Trade. At the event, costumed re-enactors demonstrate a wide range of fur trade skills and traditions such as glass bead making, open fire cooking, blacksmithing, cartography, traditional games and transportation by river and lake. The museum, composed of three historic island structures and the modern Capser Center, contains exhibits detailing Wisconsin history from 17th-century exploration and the era of the fur trade to the arrival of summer tourists, known as cottagers, in the early 20th century. Reasonable accommodations will be made for individuals requiring wheelchairs for mobility. Call ahead to make arrangements.